Delta Air Lines has been battling Alaska Airlines for market share in Seattle. 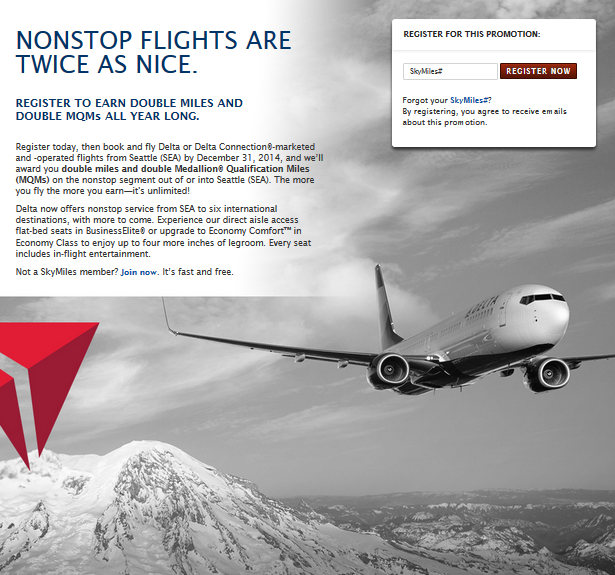 Both airlines are running double miles promotions between Seattle and West Coast cities where the two airlines compete. However, it’s important to read the fine print (which, to Delta’s credit, is reasonably clear). As I discovered yesterday, double miles offers could be only as lucrative as the initial segment. I had booked a flight between Seattle and Los Angeles via Salt Lake City, and traveled yesterday. Since I registered for the promotion several months ago, I didn’t remember the details. Disaster! I was surprised to see that when the flights credited to my account, I only received double miles for the Seattle to Salt Lake City portion, and I received only regular mileage credit between Salt Lake City and Los Angeles (note that although Alaska Airlines is now competing with Delta Air Lines on routes from Salt Lake City, Delta apparently doesn’t take the threat very seriously and is not offering a double miles promotion in these markets). It’s worth pointing out that Delta is delivering exactly what they have promised here. I just failed to carefully read the fine print. For what it’s worth, I also failed to read the fine print a month ago on an Alaska flight from Long Beach to Seattle. Contrary to my expectations, I received only ordinary mileage credit even though Alaska Airlines is offering double miles to Seattle from every other Los Angeles area airport. Long Beach isn’t on the list. Mileage promotions come and go, and Alaska and Delta aren’t the only airlines with promotions requiring registration. If you do register for a promotion, read the fine print! Otherwise you may be in for a nasty surprise when you view your statement. On this Alaska Airlines / Delta fight. I find the Delta “double miles” clear, but what is not so clear is that one will have a difficult time getting “elite” status on Delta from this year on. For the budget traveler as myself I can get the 25,000 miles on Delta easy enough, but to spend $2,500 to get the tickets is a bit more problematic. For example: Seattle to Johannesburg on Delta (or KLM/Airfrance) $900 to $1100. That got me 20,000 miles. Seattle to LAX 3 round trips is about 5700 miles. And that cost me $450. I was still about $1,000 USD short of the MQD’s (mile qualifying dollars) What I did is take the Delta flights and put them on my Alaska mileage plan. Once I got to 50,000 miles the rest of the miles that year are doubled. Once I got the Alaska Airlines “Gold” level I got the double miles for the next year. I fly at least once a year between Los Angeles and Guadalajara and Los Angeles and Seattle. And in and out of Seattle take the lousy flight through Portland (get 500 miles for the leg) and GDL to LAX take the lousy flight through San Jose California (2100 miles instead of 1300). So I get about 68,000 miles for “commuting” and one long cheap flight on Delta (19000 to India, or 22,000 miles to Johannesburg). With one more flight to fill it out I get 90,000+ miles. So those are doubled to 180,000 miles and a 50,000 mile bonus kicks in. That is 230,000 miles and I spend about $7,000 USD to do this. Now I have about 3 round trips anywhere in the world on “partner” airlines. Then I take the Expensive trips with those miles. LAX to Lusaka Zambia($1500 to $1,800 USD) Anyway I can concentrate on Alaska Airlines and get $4,000 to $6,000 USD bonus flights. Effectively giving me a 40% discount on my already cheap flights. Plus half my flights on Alaska and Delta and all of my Mexico flights are 1st class upgrades.